The late autumn and early winter present new hazards for biking enthusiasts. Slick conditions may require you to retool your bike, and items like Schwalbe Marathon Deluxe HS 420 folding bead tires can help you combat the elements. Similarly, opt for slightly lower tire pressure to improve traction and handling. "Avoid over-extending yourself and getting too sweaty." The act of biking can in and of itself be made more safe, but such strenuous physical activity can be dangerous in the cold weather. During the middle of the day, the sun can push temperatures higher, making outdoor adventures in the fall and early winter quite enjoyable. Once the sun goes down, however, cold air can settle in rather quickly. This elevates the risk of hypothermia, and for anyone who has built up a sweat during the day, wet or even moist clothing can quickly go from uncomfortable to unsafe. The best way to avoid this problem is to take breaks during your ride. This gives your body a chance to recover, and you should use this time to rehydrate. In that way, you can avoid over-extending yourself and getting too sweaty. If you plan on riding into the evening or anticipate being out past dark, a change of clothes is essential. Trade in wet, sweaty socks for fresh ones. Again, this won't just alleviate any discomfort but can also be essential for lowering your risk of hypothermia. Be sure to carry hand and toe warmers as well, and Active reported that it's best to be mindful of wind chills caused by downhill rides and other factors. The crisp calm of an autumn night is best enjoyed away from bustling city streets or the dull glow of suburban street lamps, but camping in the autumn or winter does mean facing the possibility of cold or freezing temperatures. This requires a bit of extra preparation and forward thinking. As is the case with bike touring, hypothermia is one of the biggest considerations. Working to set up camp or building a fire can cause you to sweat, and as the sun goes down, your risk of getting chilled increases. It is best, therefore, to not only bring extra clothing but to dress in layers. This way you can avoid getting too warm in the first place while also having the ability to bundle up if necessary. Camping in autumn and winter means preparing for the elements. Your camping equipment is also a key consideration when adventuring in the autumn and early winter. 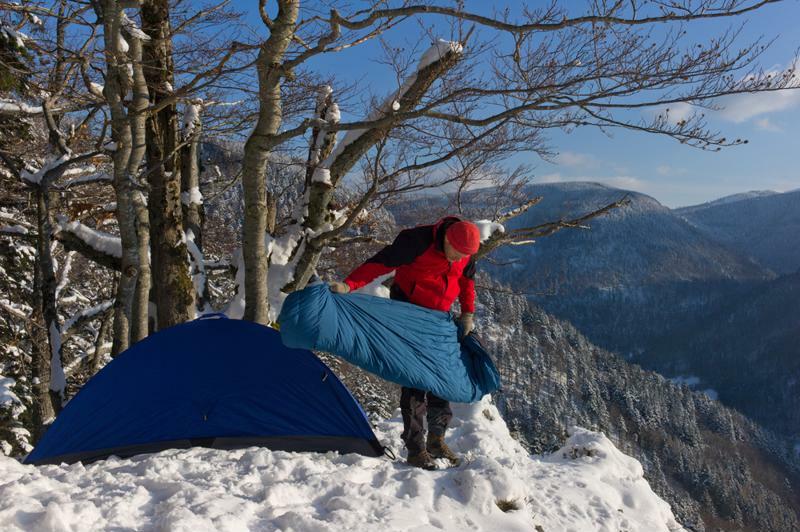 A solid tent and a warm sleeping bag are essential, and it is critical that you not sleep directly on the ground. You lose a considerable amount of body heat to your sleeping surface and a Klymit Inertia O Zone Sleeping Pad is a good way to stay up off the cold ground. Small children especially could be affected by chilly overnight conditions. Whether you're camping at an establish campsite or backpacking on your own, you're going to need a safe campfire. This starts by clearing the area around your fire pit and exercising caution, especially overnight. Be mindful of children or pets in the presence of a campfire, and always have water on hand. Another thing to keep in mind is to ensure you not only have the right amount of firewood but that you are complying with all posted rules and regulations. Many campgrounds and outdoor areas have strict restrictions on firewood, as invasive insects and other creatures can sometimes be found in outside bundles. All the same, having an adequate amount of appropriate firewood is crucial. Underestimating the amount you need could leave you battling cold conditions or without the ability to dry clothes, cook meals or brew warming beverages. When camping in northern elevations, a standard rule of thumb is that when you think you've gathered enough firewood, double your pile. Take breaks and work slowly to avoid sweating. Animals can be opportunistic in the fall and winter, especially those looking to add extra pounds before hibernation. For that reason, it's critical to be cautious about any food you bring with you. If you are camping in an area with bears or large predators, be sure to store food in a sealed container away from where you are sleeping. Sneaking a midnight snack could lure animals directly to your tent, and its best to avoid any animal encounters all together.